The Bending Branches Angler Pro was designed by kayak anglers, for kayak fishing. Kayak fishing pros don't just focus on lures and lines, they focus on their paddle. They want light weight, so paddling doesn't sap their energy. They demand strength from tip to tip, and they expect performance that matches their rigs. 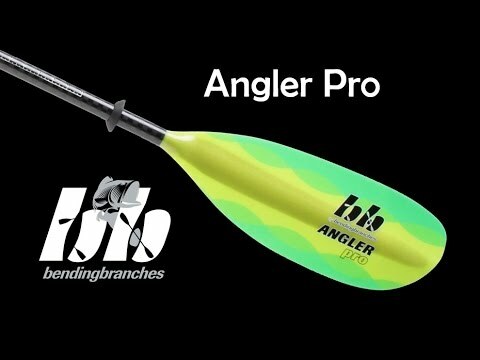 The Bending Branches Angler Pro is that kind of paddle. The Anger Pro was designed by kayak anglers, for kayak fishing. Serious gear for a serious fishing experience. This 30 oz. gem from Bending Branches, with its T-700 Carbon shaft and Multi-Laminate Fiberglass blades, makes us all look like pros. Get one, and you'll give even the pros a case of paddle envy. Closeout colors. Very sturdy shaft with little movement at the joint. Plenty of power for long paddles yet light enough so your arms aren't dead. Blades feel thin, hopefully they hold up and are durable. Had the paddle two months now without any problems. Do a lot of trolling in Jackson Cuda 14 for stripers and such in the Chesapeake Bay in Maryland. Just a light weight awesome performer. Some times spending more on the paddle really does matter after 5 hours on the water. Great product. Painless purchase Thanks to the guy's at ACK I was able to get my hands on this wonderful paddle.Light weight feels a dream to hold first class construction well worth the retail price. Super,light weight with rigid blades and shaft and it comes in camo! What else could you ask for in a kayak paddle. A bit pricey, but if you want precision crafting, you'll have to pay for it. Awesome paddle. I had been using what I would now consider a beginner / rec class paddle. It was too small for me and the kayak I purchased it for but at the time I did not know any better. After many years and lots of reading I decided it was time for an upgrade. I went with the BB Angler Pro and could not be happier. Light, stiff and strong. I anticipate many years of use. Thanks ACK for the quick shipping and safe packaging. Very nice paddle. Light, great balance. Love the measurement markings on the shaft. Well worth the investment. This paddle is amazing! Very lightweight and the measurements on the shaft are very nice too. This paddle is expensive but worth the money in my opinion. Wow. I'm really impressed with his paddle. The ferrule is really tight which was a huge selling point for me. Paddle is light and stiff. Very impressed. Light and efficient. All around great paddle for the money. Tape measure on handle is very useful. Very good paddle,nice and light and feels good in my hand,lighter than some of the more expensive paddles I looked at, and at a better price. Great paddle,very light and durable,handy tape measure built in. Q: im 6ft tall and just bought a coosa hd thats 34in wide. im assuming i would need a 250cm paddle? A: thank you for your question. i would recommend either a 240 or 250 for you. Q: Can you get the Bending Branches Angler Pro Kayak Paddle in 260cm? A: Yes. This would be a special order. Q: I'm 6' tall and am interested in this paddle for a Viking Profish GT kayak, which I plan to order from ACK tomorrow. I was using a 235cm paddle with a Jackson Cruise 12 today which I rented and the paddle length seemed too short. What length of paddle would you recommend I order? A: Given your height and the fact that you will be paddling a Profish, we would recommend a 240 cm paddle.